$85.00 Out of stock. Email me when new stock arrives. Imagine doing a "Spot Card" routine with a giant chocolate chip cookie where the chocolate chips magically appear as the cookie is turned over. That's what Mrs. Brown's Magic Cookie is all about. You remove an enormous ‘cookie’ from its package while telling the audience about Mrs. Brown’s Cookies. You mention that Mrs. Brown promises the most chocolate chips in every bite but then you discover the cookie has only one chip! As the story progresses, more and more chips magically appear until the cookie can barely hold them all! This new take on the Spot Card routine, not only gives a logical premise for the magic, but opens up an unlimited array of routines and themes to fit almost any occasion. Best of all, it will relate to even the youngest members of your audience! Two years were spent researching, experimenting and prototyping to find the highest quality materials and method to construct this professional prop. Each ‘cookie’ is painstakingly handmade from dozens of parts to achieve the final product – a beautiful, well-made trick that will last a long time. It feels good in the hands and is just plain fun to perform. One 8" 'cookie' made from steel and high quality, UV resistant vinyl. It's covered with a durable matte laminate. A four-color chipboard sleeve which not only provides an angle-proof way to introduce the cookie, but also safely stores it in your prop case. Full-color instruction manual with photos and pull-out insert to assist the learning process. 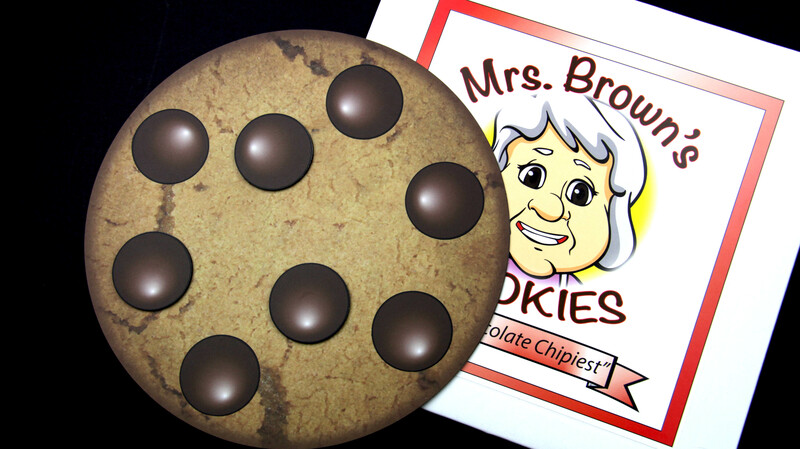 Mrs. Brown's Chocolate Chip Cookie packs flat, plays big and will fit perfectly into your case and your repertoire. Watch the video and get one. It's the "chippiest!" The Spot Card never had a story I liked but I love Mrs. Brown's cookie. I tell a story about buying a cookie on my way to the show and how they guaranteed 10 chunks of chocolate. The kids love this trick!